When you chase storms with a storm chasing tour company the tour guide, and his or her skill and personality, will be a major part of your experience. For this reason I will start a series of interviews with tour guides from different tour companies in order for you to get to know them a little bit more. In the first interview I’d like to welcome tour guide, and company owner Erik Burns, who runs Tornadic Expeditions. 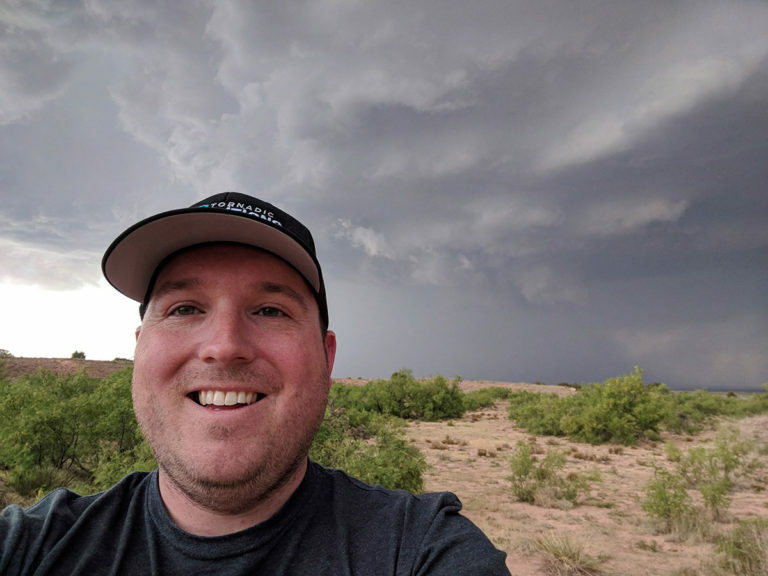 I personally chased with Erik, and Tornadic Expeditions, in the last week of May in 2016 – which had the best weather setup in ages including the epic Dodge City tornado outbreak, Bennington/Chapman, Pampa/Spearman, Leoti etc. We shared ups and downs in the most adventureous week in my storm chasing career. I live in the heart of Southern Tornado Alley the Great State of Texas! I live in Bells, TX, a small farming and ranching town about an hour outside of Dallas. Do you work with Tornadic Expeditions full time or do you have another job outside of storm season? I am the Owner and Tour Director for Tornadic Expeditions Storm Chasing Tours and I am proud to say that this is my full time job. I was able to become fully self employed through Tornadic Expeditions about 2 years ago. I’ve put so much time, energy, sacrifice and dedication into Tornadic Expeditions to deliver to our guests such a unique experience and adventure for them at all levels during their time with us. Thank you to everyone who joins us each year! We make your dreams come true chasing and you guys make my dreams come true for being able to do this full time. We couldn’t do it without you! Why did you start chasing storms? This could be long winded! I will try and keep it short and sweet! For me, it all started when I was kid. Growing up here in North Texas we experience severe weather often. Many close encounters with tornadoes and severe weather peaked my curiosity. During tornado warnings I did not want to run and I hide I wanted to look out the window! I can still feel the rush as I did when I was a kid when the warning tone goes off on the weather radio! When I was old enough to drive I just started to wander around storms. I would not call myself a storm chaser then. Just a curious soul in a car! Then one day a tornado had struck a small town not far from where I lived and after that event I was determined to see a tornado one day. I had no idea that this thought would turn into a full blown unhealthy obsession. It was my goal to a see a tornado and from there my storm chasing career began. Then on May 9, 2006 I witnessed my first tornado the Anna/Westminster, TX F3. It was all downhill from there! 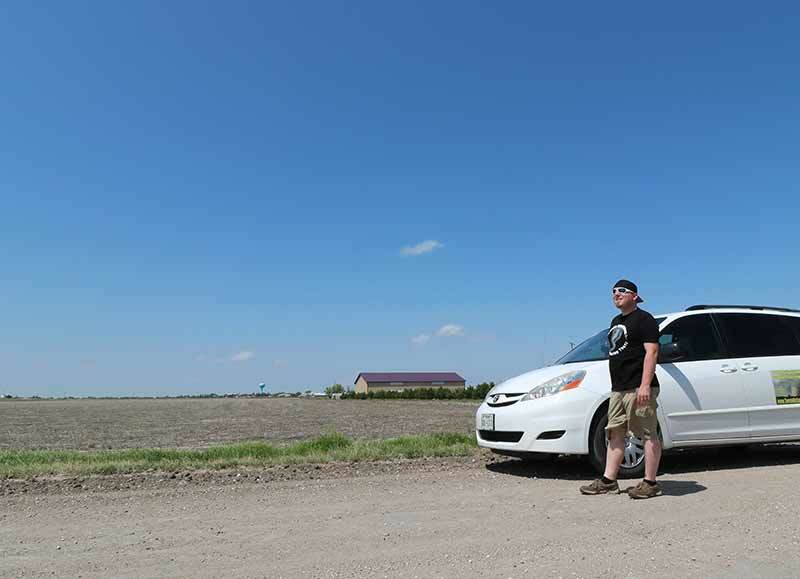 Erik Burns is waiting for towers to go up on the day of the amazing Leoti, KS, storm. Do you remember your first solo chase? Was it successful? I would hardly call my early years successful.LOL. I simply just drove around local thunderstorms, but my first “real” solo chase experience would be May 9, 2006. Where I experienced my first supercell thunderstorm and tornadoes. I did it with no radar, no internet, I simply had a paper road map and a weather radio. I was pretty much on my own when I first started chasing because I had not known anybody from the chase community. Everyone around me thought I was crazy for wanting to chase storms! Now every member of my immediate family has seen multiple tornadoes with me! I guess we are all crazy now! Do you still/often chase outside of tours as well? Oh yes! Chasing never gets old! Even with the constant grind and endless miles of conducting tours, one can simply never get enough! Outside of storm season I like to chase with my family and friends or even solo. Why did you start Tornadic Expeditions? Tornadic Expeditions more or less came to me in a sense. As my name reputation as a chaser began to climb people were starting to contact me wanting me to take them chasing. I love taking people out! Seeing the look on their faces when they witness their first big supercell or tornado is just as good as seeing the storms! Chasing brings something special out of folks. Then on May 19, 2013, I took my father on his first chase. It was an incredible first chase at that. We witnessed 3 tornadoes that day. Two of them being over a mile wide. Carney, OK EF3 and the Shawnee, OK EF4. Many chasers on this particular day had targeted South Central, Kansas. I had been keeping my eye on Central Oklahoma along the Dry Line. Even one of my chase partners tried to convince me to head towards Kansas. I stuck to my target and forecast and we scored the best tornadoes and storms of the day. Roughly 2 weeks after this event my father approached me with the idea that I start a tour company. He was saying my knowledge, passion and enthusiasm would be a perfect fit for a tour company. I was very reluctant to say the least, but the idea grew on me. After almost 2 years of research, I decided to run with it and Tornadic Expeditions was born. It has been a real blessing. We have something very special going on and people are noticing. Which weather events have had the most impact on you as a storm chaser? Goodness! There are many! I am going to pick two. First would be May 19, 2013 Shawnee / Carney, OK tornado day. This was the day that really set things forward in my path towards Tornadic Expeditions. The second would probably be May 25, 2016 where you were, in fact, part of the tour. It was during one of the first vacation tours I had ever ran. It was an amazing week of chasing. We had seen nearly 20 tornadoes during this tour, but on May 25th I blew a target. We missed the 90 minute Chapman, Kansas EF4 tornado. I drove back to the hotel that night beating myself up and my head hanging low. It was the first big bust of my career running tours. I learned a lot on this day but as you told me, “The best baseball players aren’t going to hit home runs every time and not every time do they even hit the ball”. Sure there was a moment we all were stung over missing this tornado, but could we complain? The tour guests were extremely happy with the tour, we had seen so many tornadoes and storms! What I learned from this particular event was this. All tour companies miss, we all have our good days and our bad days. As a person it is not right for me to put so much pressure on myself and no matter what happens during tours or in life just do the best we can each day and have a ton of fun doing it. I only want the best for my guests, I am extremely passionate about everyone having a good time and going above and beyond no matter what the weather throws at us! What is new with Tornadic Expeditions in 2019? 2019 is a big year for us! Going into 2019 we have added a second van to our fleet! 2019 Tour 4 and 5 are now running two vans with 4 guests per van! We had to do this due to the demand for our tours. During Tour 4 2018, all the guests rebooked for the following year while we were driving down the highway. Shortly after I decided to run select tours with 2 vans to allow more opportunity for current and future guests. We brought on some new guides this year. They’re very talented meteorologists and chasers and we are proud to have them be part of the team. They will bring added experience and skills to the tours and an added dynamic to the guests and overall tour experience! What is your ambition with Tornadic Expeditions? Where do you see the company in 5-6 years? We are going to keep doing what we are doing! We love to listen to our guests and they are really the ones who point us in the right direction for our growth. Continue to build upon the quality that our guests have come to expect and desire. What is the most common question you get from new customers when they want to book their first tour? Easy… What is the best tour period? I had been asked that so many times that I created a special page on our website to breakdown this often asked question. The short answer is there really isn’t one. Every year varies as to which one will be the best when it comes down to purely numbers. Since we are mobile and forecast each day where we need to be we put the odds up in our favor. All it takes is one amazing day to make an entire tour! What would be an optimal chase day be like? Wake up from a good sleep, target area in good shape, have breakfast and go over forecast with guests, drive to target, eat lunch, drive to open location to view towering cumulus, pick storm of the day, educate guests on what we are seeing and how it all is working, see a bunch of tornadoes, lots of high fives and hugs, maybe some guests with tears of happiness, eat dinner and celebrate, everyone go to bed with massive smiles and replaying the days events through their heads! Which has been the best chase day with T.E. since you started, if you had to pick one? Oh my! There are so many! The one that stands out the most to me would be May 28, 2018 During Tour 4. I had two guests who had been with me for several years and two new guests. We experienced a wonderful tornado and landspout outbreak in Eastern Colorado. What makes this tour special was the bond between all the guests and the emotions that ran during the chase. So many dreams were realized that day. The enthusiasm from all the guests experiencing the tornadoes and the lifelong friendships that were made. I, Christoffer, would like to thank Erik for taking the time to be interviewed by StormChasingUSA and wish Erik the best of luck in the future!